I sat here with my cursor blinking and blinking at me, waiting for the perfect way to start this post, and all I could come up with was a deep breath (how do you type that?) and feelings of wow/whoa/phew. Because, you guys -- this book changed my life. I'm talking honest-to-goodness CHANGED it. It didn't just inspire me or give me ideas or show me a little focus. It changed. me. In every single way that I've wanted to change. And it's only the beginning! 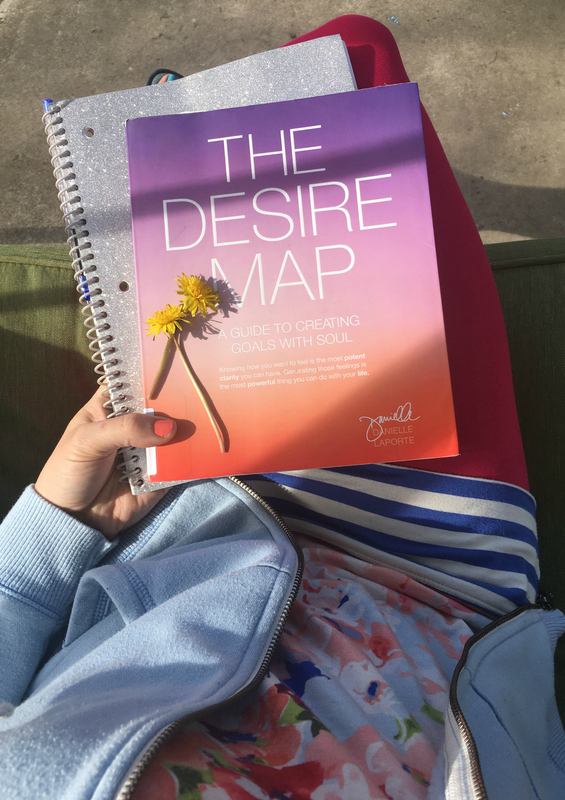 Since I started reading Danielle LaPorte's The Desire Map (affiliate), my thoughts, way of life, interactions, intentions, schedules, feelings, and even dreams have been different. Different for the better. I have been inching towards deep-seeded conclusions to long-standing wants. I've unintentionally cultivated spiritual experiences that I've been hunting for. I've gained clarity that I didn't realize I needed. And every day - many, many times a day - I have that excited, butterflies in my stomach feeling - just because I've discovered so much about myself and where I'm headed, that I am overjoyed with anticipation. I know I've just made it sound like I've reached a buddah level of inner peace and contentment, but the truth is - I still get raving mad when people that lack common sense and empathy towards others. I still want to pull my hair out when the exact areas of the house I just finished cleaning get cluttered and sticky again. Life is still messy and imperfect. But my relationship to it? Changed. The word shakes around in my head all the time lately. Sigh -- that's another thing. My relationship to individual words and the power they hold has become deep. Like an actual love affair and artistic expression type of experience. BUT, as I was seeking some personal development resources and an independent path out of a particularly bad case of seasonal affective disorder, I noticed someone strongly recommending (shouting, even) The Desire Map. This person made it sound so essential, but I had so many other things I wanted to explore first so I popped the title and author into my notes app, and forgot about it for a bit. During a fruitless search for library books, I remembered "that one book" sitting somewhere in my phone, and decided to request it since nothing else was available. I checked it out, but then I put it off again. Matt started reading it for his Miracle Morning practice while I went on to read a Nicholas Sparks novel, and then The Fringe Hours. He really enjoyed the book and its ideas, but the thing he said most was, "YOU are really going to love this book. It's made for you." He knows I'm deeply guided by emotions and feelings, and without even knowing the full contents of the book, the back cover says, "How do you want to feel?" and I could tell he would prove to be right. My favorite podcast has a feature on Fridays in which the host makes you answer the same question. How do I want to feel? It felt totally in alignment with my current path. In April, he had to travel to Charlotte for work, and decided to leave the book home for me rather than take it along to finish it. He wanted me to catch up so we could get to the point where we could talk about it together. And...I flew through it. This was totally The Fringe Hours at work, because while he was out of town I had to single parent, rush around to school drop offs with no help, run errands, keep the house clean, AND I tackled some bigger projects (like organizing the linen closet, fully cleaning our room and started building our personal paradise, and totally catching up on laundry and organizing kids' sizes not currently in use.) Despite having to be active and keep on projects and schedules SO tightly, I zoomed through this book. I created a couple fringe hours per day by scheduling 30 minutes of reading with my morning coffee, another 30 minutes in the school pickup line, and then 1-2 hours in the evening once the kids were asleep. Every time I read this book, I felt energized, excited, and hopeful. I wanted more and more of it. The book is sort of two in one - the first half talks about the ideas and the process, and second half is a workbook to put them into action. There's a series of journaling prompts to get your mind focused on what makes up your soul and fuels your heart, and it eventually leads you to a small set of words that define your core desired feelings. This small group of words is your compass for life. They are your North, South, East, West, and Center. They help you see what your path is - where you're destined, how to react, and what is worth your while. What will bring you to life. What makes you say YES! The journaling process itself was amazing for me. My answers became a map (I guess that's kind of the point, ha) for who I am. It was like I created a text book on Jenn. It's in writing. Anyone can read it and KNOW me (though I'm not sure I'd want anyone to.) But when I forget? I have a reference. During the process, I had some really intense, deep dreams. Even as they were happening I knew they held a deeper meaning and a clarity about things that meant something to me. 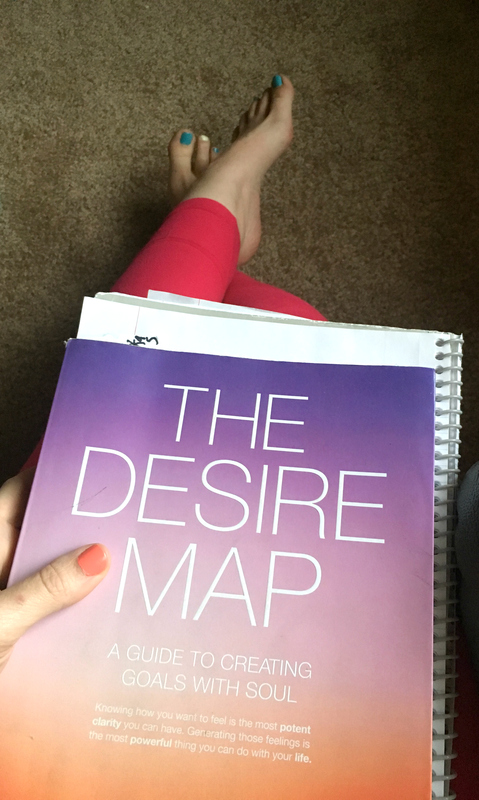 One morning, after a particularly tense dream, I woke up and journaled from The Desire Map. The dream kept coming to mind, and a specific person kept popping into my head. When I finished writing, I looked it over while also remembering my dream and I realized -- I just described both of us, and my psyche gave me hints in that dream as to what my heart values. It was a trippy experience. It brought me joy, clarity, excitement, and contentment. Knowledge in both that there are other souls out there that are a heck of a lot like mine, and that I should be content with what mine is made of. And that was only one little piece of this complicated, incredible puzzle. I originally had a slightly different list of words, but the problem I was seeing is that they defined me SO well, but they described who I am in a state of contentment. When I'm comfortable, safe, and satisfied...then I'm in a state of love, purpose, connect, beauty, and abundance. But something was missing. This set of words felt like a cozy blanket and a hot cup of coffee, but they didn't spark or energize me enough. I was waiting to feel something bigger - something motivating and exciting. What I came to realize is that those were not my words for growth. And right now, I desperately desire growth. So I jotted down the words that felt the most growth-encouraging and enriching. This is where I got a little hung up. 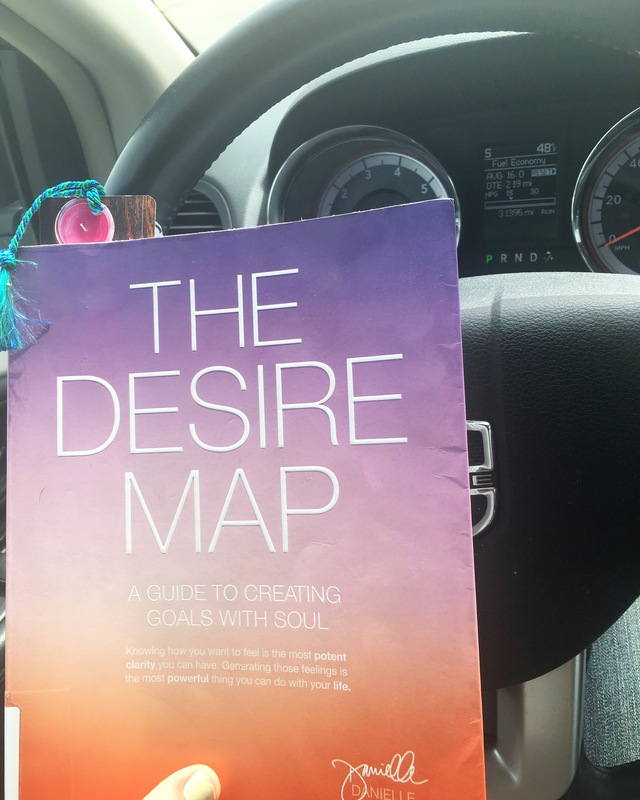 The author states that since this is your personal Desire Map, it will look different from everyone else's. She mentioned something about how your set of words should only be about 3-5 deep, and fully zoomed in as possible, but that some people would need more like 5-7 words. So I kept thinking and thinking about these two sets of words, and realized that my labels for the two sets meant something. Content and grow. Those are my two states of operational happiness. So then I started to look for different words that defined them in a prettier, more exciting way. And that's how I came up with Bloom and Enjoy. Those two words excited me so much, that when I wrote out their definitions, I peppered them with doodled hearts and starts. They were a giant YES! I loved them so deeply that I considered having just 2 words (talk about a total 180.) But then I realized how very-very much I desire Purpose and Connect. I could wiggle those into Bloom and Enjoy if I tried hard enough, but they stood on their own as important factors in my happiness. I can't wait to dive into each one of my words more deeply - both to share my relationship with them with you, and to see them even more clearly myself. Here's where the truly fun part came in for me. First, I love that I got to share this with my husband. It was fun, entertaining, vulnerable, enlightening, and enriching. We sat down (in our new bedroom sanctuary, ahhhh) and read our answers back and forth while eating Rocky Mountain truffles. Some of our answers were exactly the same, some of them were different expressions of the same idea, and some were strikingly different. It was even funny to see how our personalities shined through our answers - him with efficient, clean, one-word answers, and me with bulky, emotional lists. We each had an answer or two that we were embarrassed to share, but doing so felt really good - especially because I knew I was sharing it somewhere safe, and it feels good to own it. And second, it is an extremely fun and exciting process to plot out the ways to cultivate your core desired feelings. Not only is it fun to plan new (or better) experiences, there's a new drive involved when you can tell that you're doing it for all the right reasons. Reasons that are going to light up your soul and fulfill your most deep-seeded needs. I took an action yesterday that satisfied a few of my words, and my whole body was like -- zing! I have a lot of ideas and work to do, but my entire being is totally energetic about it. Yes to that, right? 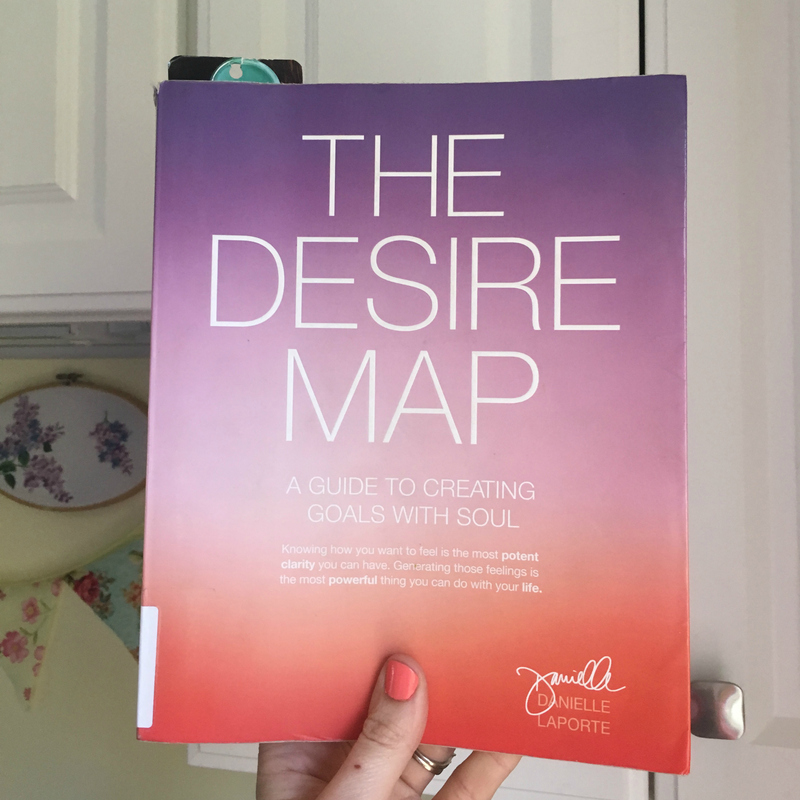 The thing about The Desire Map that I think is worth your while, is that it's not just another book about the pursuit of happiness or a method or timeline for completing goals you have. It really takes you to the root of your desires - it makes you think about why you want the things you want, and how maybe, you have more of it already than you realize. It helps you craft a guidebook for who you are. It establishes a sense of self in a way that you wouldn't otherwise take the time to articulate or set to paper, and makes it so you have a true working knowledge of yourself. I didn't know that I needed these things in quite this way (what, with my years of writing about myself already, and making list upon list on every topic) but I have learned a lot, and found so much YES here. Trust me when I say - you could use this. It is extremely gratifying to map out your personality, your desires, and what makes you tick. It's worth it! PS - You can grab a Kindle copy if that's how you prefer to read, but also pick up a blank notebook for the journaling section - you'll need it! PPS - The 2017 Desire Map Planner is now available to order!!! Check out all the details on the different types and designs there are, HERE. Mine is on its way to me, and I can't wait! I can't wait to read this book! I have it downloaded but I haven't started it yet. I need to do that!